“06880” does not usually cover high school reunions. Each one is special to the people in that class. Today though, we make an exception today for the Staples Class of 1958. For one thing, they celebrated a milestone this weekend: their 60th reunion. Over 60 alums traveled from around the country to enjoy dinner at Rizzuto’s, a party on Owenoke and a breakfast at Compo Beach. The heat did not deter anyone. For another, theirs was the last class at the old Staples High School on Riverside Avenue (now Saugatuck Elementary). For a third, it was the last that included Wilton students. Wilton High School opened in 1959. So yes, the Class of 1958 is special. Congratulations to all. See you at your 65th! 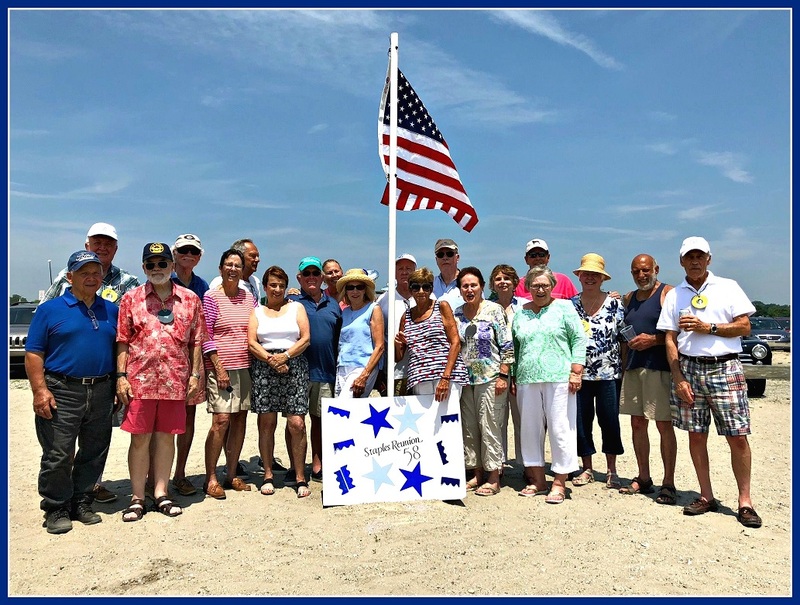 The Staples High School Class of 1958 continued its reunion today at Compo Beach. This entry was posted in Beach, Staples HS and tagged Staples High School Class of 1958, Wilton High School. Bookmark the permalink. Keep on keepin on, 58! Dan, It’s too bad you couldn’t have identified them. Who is the guy on the far left with the blue shirt? Do you have any idea? My Dad, Butch (Michael) Marushak. Jane, Thanks for the response. He looked familiar, but I’m not sure from where. Blue shirt is Butchie Marusak still has is car from high school. Oops.. Also thanks to Ksthy C. for your response! That’s a great turnout. Roughly how many people were in that class? Does anyone have any specific memories of when Connie Francis performed at Staples (which I learned about from Ed Baer, who was the promotional DJ at that event)? There were about 265 members of that class. Thanks Dan for capping off our celebration! I believe we were 245! Dan…. Thank you so much for stopping by, taking our photo and posting such a beautiful tribute to the class of 1958. Our era was indeed the best of times…. Yes! I was there ! Gosh, they all look terrific! Love to see this celebration of tradition, especially in today’s divided world. Is Mike Calise second from the end on the right ? My brother Carl was in that class too but I don’t see him in the picture. Yes, that is Mike Calise. Looking good, like all his classmates! We were sorry he did not come. Maybe we don’t have the correct contact information for him. Members of the class asked where he was. The first Staples High School was referred to as the Old Building … even by administrators when assigned for classrooms. My homeroom was there sophmore year with Mike Calise. I believe chem class as well .A Capella Choir with John Ohanion on the top floor overlooking the Saugatuck River. Best of times … yes and we walked nearly a mile in the snow to the bus in Wilton ha ha ! I’m curious. Does anyone have recollections of Christopher Lloyd, from the class of 1958? How about a Mary Sargent? Thank you for the great article. We had so much fun. Thank you Anne and all those who made it happen. Thank you Dan for the post for those of us who couldn’t get there. I really wanted to come but family business brought me in too early. “I spy”, I think, Alan Doldge third from the left. Anne Parnas is second from the right of the flag and Sheila Breen in just behind her. Michael Calise has already been identified. I will most eventually figure out others by making the picture larger. It is a little hard to be sure between sunglasses, hats and shadows. Dan, I find it amazing that every woman, from that picture, from that class of 1958, look so young! They look like they could be from the class of 1978, not 1958! I completely agree. No way did that group graduate from high school 60 years ago. They all look way too young!! Jack, excuse me here if I’m wrong but I think I must have met you back in the late 60’s mid 70’s. My father was Edward Hayes. He worked for the Bridgeport Post for a few years, but had a stroke at 29 y.o., and then got a job with Famous Artists Schools. He worked there for many years until it went bankrupt. My mother’s family, Dorothy Devore Hayes, owned Devore’s bakery in Fairfield. My father was an avid bowler in bowled in many leagues at your bowling alley. But, being 60 y.o. My memory may be serving me wrong. Please ignor this post if I am remembering wrong. Tim, I put on many pounds, due to my Sunday visits, to Devore’s, on the Post Road. I’m sure our paths crossed in the late 1960s and early 1970s, but I don’t specifically recognize your name. I would probably recognize you, if I saw a picture of what you looked like in 1969. If you want to forward one to me, Dan can give you my E-mail address. I noted you used to go to the pool room, so that’s where I’d recognize you from. Tim, If you want, send me a picture of your father too. I knew, by face, many of the bowlers, but not specifically by name. Thanks for responding Jack. Will say that Devore’s donuts were delicious. Yes, I must have met you in the pool room. So glad your family decided to invest in two family fun activity centers! Your family’s two facilities gave so many of us Westporters so much fun. Thanks for the positive influence your family businesses had on town. Tim, Thanks for the kind words. I took a screenshot of your comment to send to my kids! Dan, Thank you for making the exception & writing this article about Staples’ 60th Class Reunion! It sounds like it was a huge success, & the article was especially meaningful for those of us who weren’t able to be part of it. My thoughts & heart were with my former classmates this weekend, & I deeply regret having to miss the fun! Dan great article and photo about our reunion, we all had a great time and we will have great memories….I’m standing near the flag pole, still live in Wesport and not far from old Staples School…Thank again! Theresa, Are you related to Mary Kovacs, who would be around age 70? Everyone is really enjoying your article Dan. So glad you came down to take a picture and write a great article. It is really appreciated. Thanks, Anne. You’ve got a fantastic, classy class!